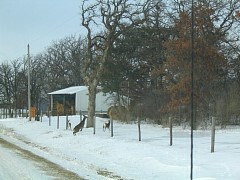 Here is the view out the truck window as Jim and Casey the dog and I drive to our hunting area. Casey gets to ride with Jim in the cab until I meet up with them - he always gives me a mean glance when he gets banished to his cage in back. It's a few degrees above zero Fahrenheit now, and it will only get to about 10 degrees above today and tomorrow. We had snow and freezing rain a week ago and were hunting on glare ice. 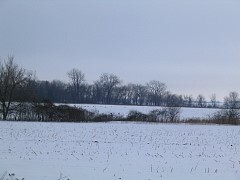 A few more inches of snow has fallen on top of that in the interceding week. 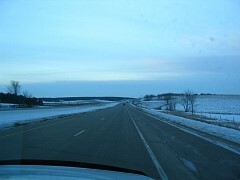 Due to the wind, some areas are still glare ice, while some have snow over the ice. In the latter case, the drifted snow is not deep, but now as you walk along you break through the frozen crust a few inches below the surface on nearly every step. This "dual action" - step-crust-break-sink, step-crust-break-sink, can be very tiring. Right off the bat we began to spot pheasants out foraging for food. I should have brought my other camera which would allow better close-ups. 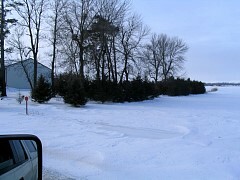 We saw a rooster here near this shelter belt of evergreens near a farmyard. 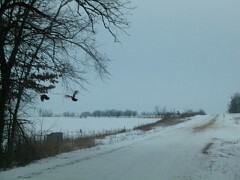 This time of year the birds often retreat to these areas in the dead of winter. This time of year we may see lots of pheasants without being able to hunt them. That's okay. 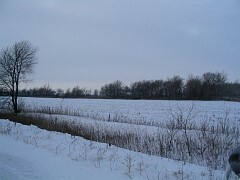 The crops stayed in a long time because the fall was wet. 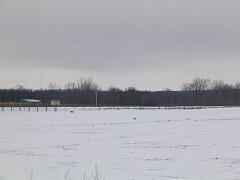 Pheasants were able to stay dispersed longer and avoid Mr. Hunter. Consequently, many roosters are still around. 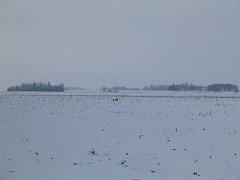 The object to the right of the row crops is another rooster out looking for food. Pheasants will use their claws to scratch down along any vegetation sticking up to look for corn or soybean kernels nearby. 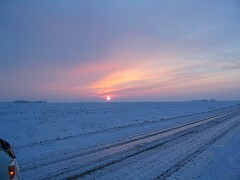 I need to learn how to set the white balance and take better winter pictures. 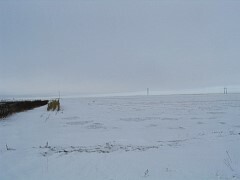 Bleak surroundings, aren't they? 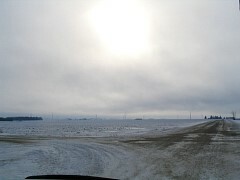 I thought the overcast winter sky looked pretty. 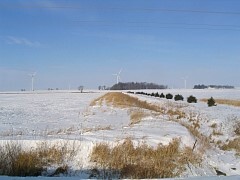 There are now quite a few wind farms throughout the countryside. I think they ruin the look of the landscape. Roosters out in the void. 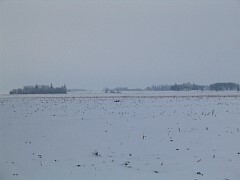 Like I said, there is still many areas of glare ice on the ground, When pheasants run, they do so in a crazy, zigzag pattern. This trait allows them to dart out of the way at the last second if a hawk is swooping down on them. But these quick cuts on glare ice also make them fall down! 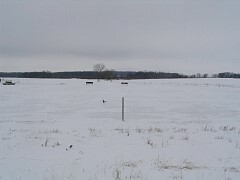 We have seen a dozen pheasants slip and fall on the ice. Quite comical. Of course, it's not been so comical when we have fallen. 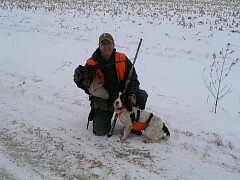 This has been a good year for our group for finding pheasants. 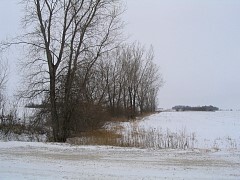 Earlier before the snowfall, we drove past a ditch with a rooster standing out in plain sight. Jim drove further down the road and dropped Brad and Brad's dog and I off, then turned around, drove past the spot where the rooster has been seen (he now was undoubtedly hiding in the cover in the ditch) and continued further along the road until he could get out with the dog and not flush the bird. We walked toward each other, trying to pin the bird between us. Brad's dog flushed a hen. Suddenly, close to Jim, the rooster flushed and Jim shot him. We continued our "pinch" when suddenly a rooster flushed in front of me. As he flew high off to the right I dropped him and Casey ran to get him. A second rooster was unexpected, so too was the third. He flew off to the left and either Brad or I dropped him with a long shot. What had been a day with few rooster sightings ended with quite a bit of activity. This year's ice has been unusual. 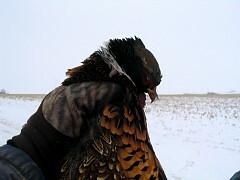 The prior week I shot a rooster that fell out of sight on an iced-over soybean field. 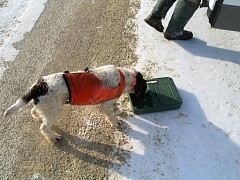 Jim brought the dog, but since so many pheasants had been in the heavy cover in the area Casey couldn't track it down. There was a thin fence line running 1/2 mile south to the road where the truck was parked. We finished our hunt, with Casey flushing a rooster for Jim to shoot. 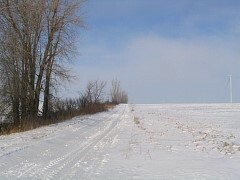 We took the fence line back to the road, with Casey not picking up any scent. 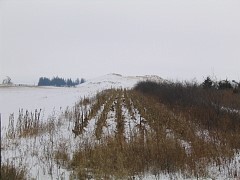 In the heavy cover of the road ditch, Casey suddenly lit up and flushed a hen. 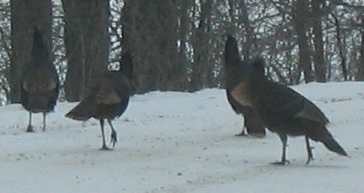 Jim and Casey continued walking to the car, but I was still perturbed about not finding the rooster I shot. Standing and staring into the ditch, out of the corner of my eye I spotted the wounded rooster darting between clumps of cover. "My rooster! ", I yelled at the top of my lungs. Jim brought Casey for the retrieve. That rooster ran 1/2 mile and even managed to eluded the dog - who is a very good hunter. Those wiley roosters ..
We got in the truck and drove around to walk the ditch we observed birds we flushed on the first hunt fly to. Jim dropped me off then drove back so we could work the ditch in the manner of Masinissa and Laelius's decisive attack on Hannibal's forces in the battle of Zama in 202 B.C. 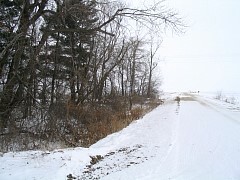 On the way down the road, Jim spotted a rooster flushed from the first hunt just sitting in the open in light cover of the ditch. He and Casey got him. Then, as they got close to me another rooster flushed. I missed him, but Jim put a few pellets into him. The rooster flew about a 1/4 mile and landed in the open near some heavy cover. Jim thinks he hit the icy ground hard, but I thought he landed. As we began to walk down the road back toward the rooster and the truck, the rooster got up and started to run to heavy cover out in the section. Suddenly he stopped, then ran back to the ditch. 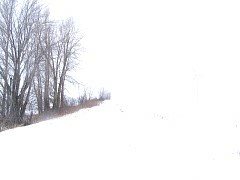 As he ran up the incline to the road, he slipped and slid back into the ditch. We watched in amazement. He ran up the incline again, crossed the road, and hid in a clump of weeks near the fence line. Seeing where he landed, had we not witnessed these maneuvers, we would never have guessed where the rooster would ultimately end up. We got our limit of four roosters in about ninety minutes. 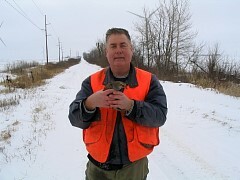 We cleaned two of the birds and gave them to the landowner - a nice guy who always lets us hunt on his property. Enlarge the picture on the left. 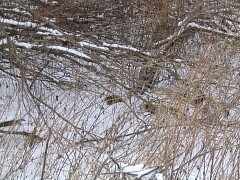 This is typical late-season scene - a bunch of pheasants crowded together near in cover near a food source. 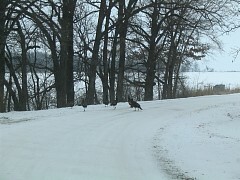 We stopped at the nearby house and I asked if we could go after these roosters. The woman said no, that when her husband came home he would want to hunt them himself. That's quite all right. 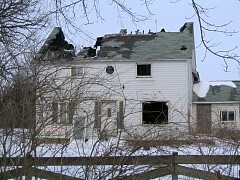 There was a gray cat sitting on the windowsill of the burned-out house: I can't see him now. You can see him on the extreme right side of the big ground floor window. 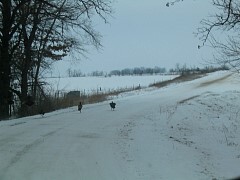 Enlarge this to see a group of turkeys. Southern Minnesota is full of them. 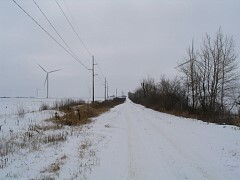 An un-improved road leads across the section. We didn't dare tackle this road, even with Jim's 4-wheel drive truck. The next day a man hunting with his young son will get his mini-van stuck down this road. Jim and his dog Casey. I dropped Jim and Casey off at the other end of the section and drove the truck around to this point, then walked down this ditch to meet up with them. Jim shot a very young rooster - it even cackled as it flushed. Looking at it's coloration at first, we thought it might be a hen. Later in the day, we determined by the feathers around the eyes and a bud where the spur develops that it was indeed a rooster. I didn't take a picture ... Every year, hens get shot by mistake. What does one do? I believe most hunters just throw them away. Neither of us will shoot at a bird we can't positively identify - for us killing isn't the main attraction of hunting. We walked on either side of this heavy cover and along this road - I missed a shot at a rooster. 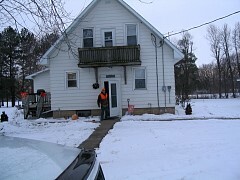 Jim coming out of a farmhouse after asking permission to hunt the next morning. We have been asking permission here for many years, and know the couple. 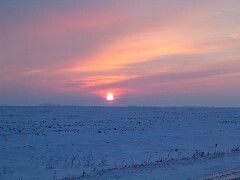 They are always amazed we still hunt when it gets so cold in the winter. These two roosters are fighting over a cob of corn. I wish I had my long-range lens. Jim called for the camera and snapped a picture of a rabbit hiding along the road. 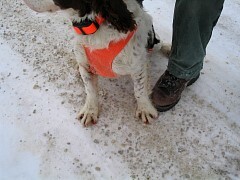 Far left, a rooster tail sticks out of Jim's game pouch. The ice crust has been brutal on Casey's feet. He doesn't act like they hurt. At the farm Jim shot a rooster, I missed one. 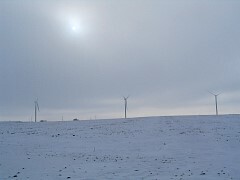 I can't abide the huge wind turbines springing up all over. I think they are a blight on the landscape and an abomination. Since farmers get $12,000 per year for each of the turbines placed on their land, wind farms will continue to pollute the skyline. 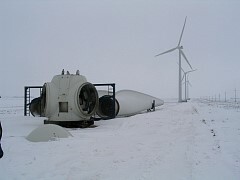 The short roads leading to the turbines have to be constructed very heavily to carry the weight of the turbine parts. 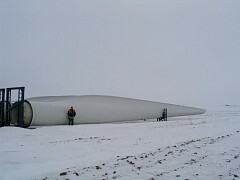 Here, Jim and I topple and dismantle yet another turbine in our protest movement - FIGHT THE (wind) POWER! 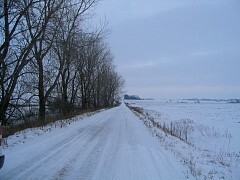 This is the seasonal road that we wouldn't drive down yesterday. I am dropping Jim and Casey off and I will drive around to the other end then walk and meet up with them. My view down my end of the road. I no sooner got out of the truck when it appeared Jim was almost finished walking. As I started down the road a rooster flushed and I missed him. The guy on the road was not Jim, but some other hunter who had got his van stuck on the unimproved road. The rooster I flushed flew off the way I came and landed across the road. I continued toward Jim and suddenly a covey of gray (Hungarian) partridge flushed - I shot one and it dropped near a fence line. A covey of Huns might include 20 individuals. 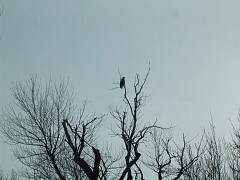 They fly fast and low - usually only ten or fifteen feet off the ground. If the covey stays together, they might fly a long way off, and you won't see them again. But if they break up into smaller groups, they will stay in the area and you can re-flush the small groups or individuals again and again. 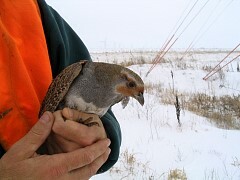 While this species is native to a vast region of Europe and Asia, the birds used in initial North American stocking attempts came from Hungary; hence, the name Hungarian partridge or Hun came into common use. 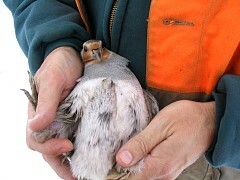 Today, however, gray partridge is the scientifically correct name. 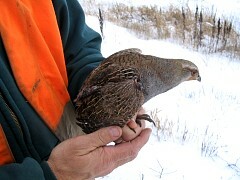 The gray partridge form coveys from early fall through winter. At night, covey members (usually 8-15 individuals) roost in a tight circle with their heads pointing outwards; this gives all members of the covey mutual protection from predators and helps conserve body heat. Since the "real" Jim (and more importantly his dog) were still a ways off, I walked up to the fence line to try and make the downed bird hide instead of running off. I followed the tracks in the snow and saw they ended abruptly. Looking closely, I could see a brown wing tip in the snow. Yup. The Hun had buried itself in the snow to hide. They use their wings to displace fluffy snow and burrow out of sight. Pheasants will do the same thing. 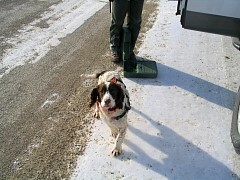 Jim brought Casey and the dog retrieved his first Hun. 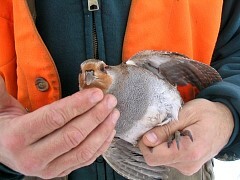 Many sportsmen mistakenly identify a large horseshoe-shaped, chestnut-colored patch on the lower breast as an exclusive male characteristic. While this patch is most common on males, it is often found on females and is occasionally absent on males. Males generally have more rust colored wings and shoulder feathers than do females. Female wings are more brown, and exhibit dark brown cross bars and brown mottling (irregular spots of different colors that vary in number and size) on the shoulder patch. Females have a mottled coloration overall and brown crossbars on individual feathers. 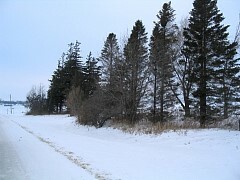 We walked across the road, Jim and the dog on one side of this tree line/woodlot and me on the other. The same rooster flushed for me with the same result as before. He flew down the road where I shot the gray partridge, and when we went after him again I broke through the ice near a beaver dam and went in the water to my thighs. Jim had an extra pair of socks for me to wear, but I was uncomfortable the remaining two hours of the day. Near sundown, Jim spotted another covey of Huns under these trees. I shot one through the trees. It was a good weekend of late-winter hunting.